For the past few decades, a paradigm shift in New Testament scholarship has led some researchers to question whether the church has rightly understood first-century Judaism and the apostle Paul. In the name of a “New Perspective on Paul,” certain men are calling for a reassessment of the traditional Pauline understanding of the doctrine of justification, the nature of good works, and other elements essential to the gospel of Jesus Christ. Prominent among these figures is N.T. Wright, bishop of Durham and theologian who in his voluminous writings is demanding a new reading of Paul, even claiming that the Protestant Reformers misunderstood the apostle. These accusations cannot be easily brushed aside, for they strike at the heart of our entire understanding of salvation. 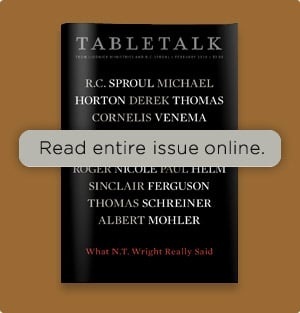 With an aim to analyze the merit of Wright’s claims and expose both the strengths and weaknesses of his approach, the editors of Tabletalk magazine have put together this collection of tools to help Christians discern the errors behind the approach of N.T. Wright. 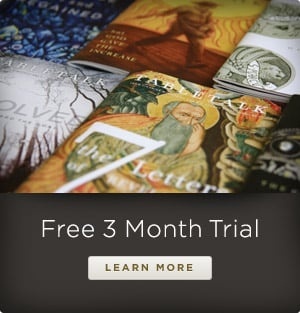 It is our hope that you will find these resources helpful in understanding the biblical doctrine of salvation and for making an informed assessment of the work of Wright and other New Perspective thinkers. Ligon Duncan answers the question, "Does Wright's stance on the perseverance of the saints relieve him from legitimate scrutiny on justification?" Is Wright Teaching Another Gospel? Ligon Duncan and Sinclair Ferguson address the question, "Is Wright teaching another gospel from the New Testament, as understood & written by the Apostle Paul?" Why Has Wright Struck Such a Chord? Sinclair Ferguson and Ligon Duncan explain why N.T. Wright has struck such a chord with the evangelical community. In this video, Albert Mohler leads a panel discussion at Southern Baptist Theological Seminary with professors Tom Schreiner, Mark Seifrid, Denny Burk, and Brian Vickers on N.T. Wright and the Doctrine of Justification (September 2009). Why does the believer in Christ not fear the wrath that is justly due to his or her sins? James White from Alpha and Omega Ministries examines this question. Sinclair Ferguson discusses imputed righteousness in this speaker interview from the 2008 Desiring God National Conference. Denny Burk leads a panel discussion at Boyce College on the subject of N.T. Wright’s new book Justification: God’s Plan & Paul’s Vision (April 2009). Denny Burk is joined by SBTS professors Tom Schreiner, Mark Seifrid, and Brian Vickers. In this audio file, Albert Mohler leads a panel discussion at Southern Baptist Theological Seminary with professors Tom Schreiner, Mark Seifrid, Denny Burk, and Brian Vickers on N.T. Wright and the Doctrine of Justification (September 2009). Albert Mohler interviews John Piper and Ligon Duncan on the topic of justification by faith and the New Perspective on Paul (August 2009). D.A. Carson examines the New Perspectives on Paul in this first of three lectures. D.A. Carson examines the New Perspectives on Paul in this second of three lectures. D.A. Carson examines the New Perspectives on Paul in this last of three lectures. Dr. Cornelis Venema provides a critical assessment of the New Perspective on Paul. This lecture was presented at the 2004 annual meeting of Reformed Fellowship, Inc. Learn more about Reformed Fellowship at their website www.reformedfellowship.net. Attacks on Justification by Joseph Pipa Jr.
Joseph Pipa addresses contemporary attacks on justification. Michael Horton provides nine points on the New Perspective in this first of three lectures. From an adult Sunday school class at Christ United Reformed Church in Santee, Calif., where Dr. Horton is a member. The Christ the Center panel discusses N. T. Wright’s new book Justification: God’s Plan and Paul’s Vision with Guy Prentiss Waters, associate professor of New Testament at Reformed Theological Seminary in Jackson, Miss. Dr. John V. Fesko, academic dean and associate professor of systematic theology at Westminster Seminary California, joins the panel of Christ the Center to discuss his book, Justification: Understanding the Classic Reformed Doctrine. Two Birds, One Stone by R.C. Sproul Jr.